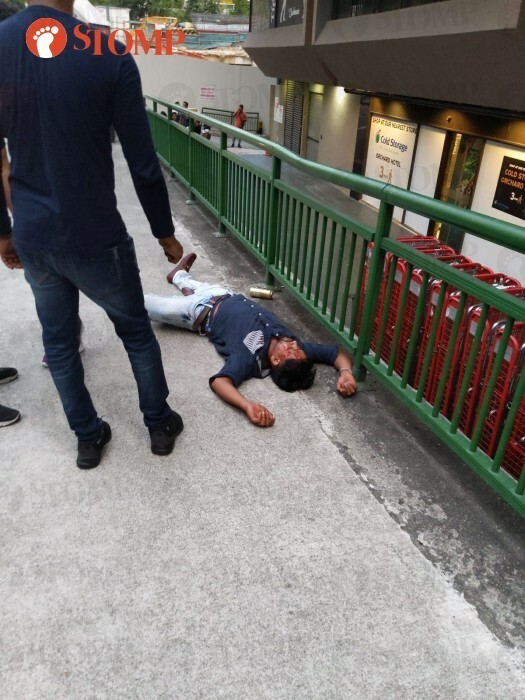 A 29-year-old man was arrested following a fight that broke out outside Orchard Towers on Sunday evening (Feb 24). Stomper James said he witnessed the incident at around 6.30pm and called the police. He recounted: "I saw a group of more than ten men coming out from Orchard Towers. "Two of them in particular were angry and wanted to get even with each other. They walked towards the back and started pushing each other. "When the fight got intense, one man took out his belt, wrapped it around his hands and used it to hit the other guy." This other guy was later seen lying on the ground with blood on his face, said James. A video taken by Stomper Anonymous shows the two men exchanging blows. One of them appeared to have a belt wrapped around his left hand. A third guy can be seen trying to stop the altercation. James added: "The police later arrived with an ambulance. "Most of the group had left the scene by then but I saw four men being questioned." Responding to a Stomp query, the police said they were alerted to a case of affray at 400 Orchard Road at 7.17pm. The Singapore Civil Defence Force received a call for assistance at around 7.20pm and conveyed a man to Tan Tock Seng Hospital in an ambulance. The man, who was conscious when taken to hospital, was subsequently arrested in relation to the case.